In New York magazine’s Spring Fashion issue, there are six feature stories on clothes, designers, and models including a story on a group of tenderfoot but fresh-faced white male models (“Fashion Week’s handsome rookies”), an interview with style icon Kate Moss on her clothing line at the much-anticipated and much delayed opening of TopShop in downtown Manhattan (recent reports have doors opening in April 2009), and a recession-minded article with an increasingly familiar theme, “Everything Here is Under $100”). In addition, there is the usual array of designer label advertisements and celebrity spokesmodels: Posh and Becks for Emporio Armani, Katie Holmes for Miu Miu, Gwyneth Paltrow for Tod’s, as well as an anonymous sea of puerile, well-heeled, ivory-faced Gothamites slinging everything from Marc Jacobs handbags to cocktails to lifestyles. Jessica Lustig’s article, “The Fashion Thief,” was the only feature story or advertisement in the Fashion Issue that featured a person of color, any color. 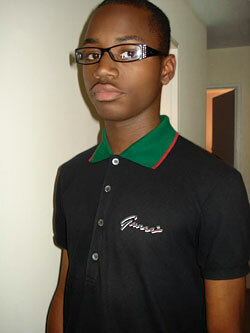 Lustig follows Kevahn Thorpe, an African American young man from Queensbridge Houses project in Queens, New York, as he is arrested and rearrested for shoplifting from high-end Manhattan shops like Prada, Bergdorf, Barneys, and Saks. There’s a lot about this article that’s unsettling. For instance, Kevahn’s love of fashion is pathologized and made irrational (he’s a “fashion fanatic . . . for whom jail was not too steep a price to pay”) as if coveting fashion in New York City is at all unusual. Moreover, Kevahn’s “crafting” (his preferred term for shoplifting) is anything but irrational. Part of the “crafting” for Kevahn is his careful study of fashion labels, their histories, designers, and floor arrangements. Also, repeated mentions of his single black mom and hardscrabble life in Queens reifies tired “culture of poverty” theories from the 1970s and 1980s that blamed black mothers, specifically, and black families, generally, for all the problems of the “underclass” rather than, say, systems of institutionalized racism and uneven distributions of material and social resources, power, and wealth that privileged middle and upper-class whites. But most disquieting for me about this article is its inclusion in New York‘s Fashion Issue during Spring Fashion Week. While all the white models, celebrities, and socialites who crowd the pages of this and so many other magazines are implicitly citizens of the fashion world – their unquestioned rights to fashion’s material objects and its privileges substantiate this – the lone trespasser is a black man who is repeatedly surveilled and forcibly removed out of this world’s borders. His claims to fashion, self-fashioning, and self-actualization are publicly denounced by the headline which identifies him as a “fashion thief” but also by the numerous, mostly anonymous, readers of the article whose online comments against him rise to the level of vitriol. The racial logic of this article is not unlike those found in other magazines – some of which have been mentioned in this blog (see Oops, Background Color, Redux, and Background Color, Redux II). African Americans as well as other racial groups, when they’re featured at all in fashion and style magazines, are routinely figured as abject, subordinate, or illegitimate bodies that serve to highlight the true white subjects of fashion. 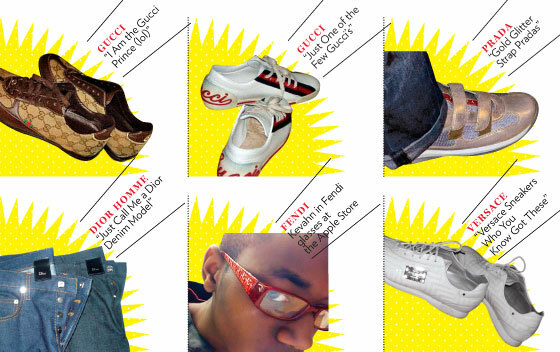 Kevahn catalogued all that he stole on MySpace, adding his own fashion credits and commentary. 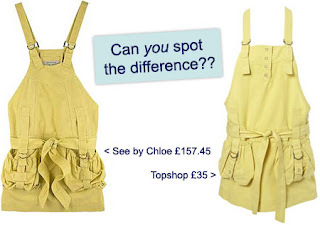 Should there be any doubt as to which direction fashion’s democratic impulses flow, one need only consider See By Chloé’s recent legal victory over Topshop to know that our inalienable “right” to fashion (to paraphrase Sarah Jessica Parker) has its limits and certainly does not extend to Chloé’s yellow over-all dress (on sale now for $205 at Net-a-Porter.com, http://www.net-a-porter.com/product/19187) which they argue the British mass market retailer copied from their cruise collection (and sold for about $70). 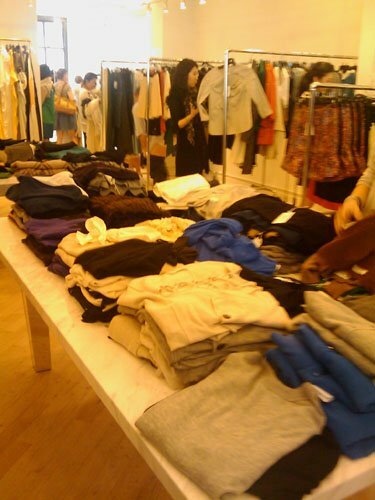 For this misstep, Topshop agreed to pay the Paris house £12,000 (roughly $24,000) in damages and legal costs and destroy the remaining 2,000 dresses (744 dresses were already sold). I have to admit that I find this a curious decision for an industry that is constantly recycling, referencing, reinscribing, and reworking fashions from other cultures, eras, and social groups. I wonder how much the Harajuku street kids will get from their settlement against Gwen Stefani . . .